Fake FLAMING TIKI HEAD LAMP Luau Jungle Safari Pirate Theme Faux Flame Lantern Party Decoration - Hawaiian Tahitian Tropical Island Decor. PLASTIC portable dimensional Voodoo inspired Tiki Totem with stone-look carved features. Battery operated fan blows silk-like mouth flames with color lights create fire illusion. 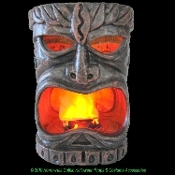 Make your luau sizzle with our FLAMING TIKI HEAD Decoration! This tropical decoration is a plastic tiki totem with black carved features made to look like stone. A small fan blows on the fake silk-like flames in the mouth with color lights that create the illusion of fire! Voodoo inspired Jungle Safari Black Panther Theme Tiki Head Decoration is BATTERY OPERATED, making it completely portable and allowing you to position it almost anywhere. Made of plastic, both sides have a tiki head, one side opening with a battery-operated plastic flame. Stack multiple tiki heads to make a tiki totem pole! A terrific deck party decoration for any Hawaiian Luau, tropical, man cave, summer or beach inspired event. Orange color steady lights and tiny fan make the billowing fabric flame appear to be burning. Unit is approx. 13-inch (32.5cm) High x 9-inch (22.5cm) Wide x 8.25-inch (20.63cm) Deep. Features an OFF and ON switch on the bottom, and optional jack for your own UL approved *Electric AC Adapter (*NOT included). -Optional AC *Adapter Jack (*Adapter NOT included). -OFF and ON switch on the bottom.